Standing before the Council of Sages, it was hard to hide my nerves. These were my teachers, mentors … My family. There was no need to be nervous, but ever since the moon hid her face there had been an air of anticipation permeating the pile of rocks … Uhm, the Keep, I called home. I pulled my attention back to Council as the leader of the Council began to speak. “The time has come for you to begin the journey into your future.” I felt my eyes widen with surprise, but I held my silence. “You will be given all you need to survive your journey.” A page to the Council moved in front of me, her arms holding a staff topped with a beautiful crystal and a cloak. “Where am I going?” I asked while fastening the cloak around my shoulders. From what seemed like a far distance I heard a gasp escape when I took hold of the staff. It automatically adjusted to my height and felt as though it had always been in my hand. “You will go North until the moon shows the entirety of her face. There you will find your home until it is time to continue your journey. You will depart when the day overcomes the night.” The Council disappeared from my sight. When I stepped from the Council chamber, the first thing I noticed was the first rays of the sun dancing across the beveled crystalline windows of the Keep. Tears pricked my eyes at the thought of my few possessions I would have no time to collect for one did not disobey when told to leave, so I vanquished the tears and with my back ramrod straight, I stepped out to greet the new day. As I walked, I found a waterskin with a broken strap that was easily fixed, and a traveler’s pack found hanging from a broken limb. The ability to carry water and food found along the trail eased many of my worries. Living out in the temperate climate of my childhood home held little anxiety for me, but I worried about what I would find as I entered the northern climes, for they were not known for their hospitality. Puzzling on the words spoken by the Head of the Sage Council, I still had no answers when my boots first crunched in the snow. The staff provided the spark for my fires, my cloak warmth from the sharpest cold. As I held to true North, water was plentiful, and there always seemed to be a rabbit or partridge that willingly sacrificed itself for my supper accompanied by tender shoots along the streams or winter berries the birds were willing to share. Using what I had learned, I was able to keep my fears for the future grounded until I could feel them flow into the earth with each step taking me closer to my new home. With my body hardened to the trail and my mind armored against my anxieties, I watched the clouds part to show me the full face of the moon. Between the light of my staff, and the light of the moon, I felt no need to stop for the night. I continued to follow the small stream that had provided my water throughout the day. Seeing a hedgerow at the edge of the trees, I squeezed through the opening as the hedge grew around the flowing water. Gaining my feet, I picked up my staff and shook the snow from my cloak. Looking up to see where next my path would lead, I saw the moon shining upon a Keep sitting atop a rocky isle rising from the frozen lake and knew I was home. Winter in San Francisco generally means temperatures in the mid 40s to mid 50s and fog. Sometimes really thick fog. That does seem to be the case this year. Even though I live a good 45 minute BART ride outside of the city, my little city can get pretty socked in too. Fog means dangerous driving conditions, particularly when you don’t know the roads you’re driving on. For me, I find fog mysterious and beautiful, especially when it hangs low over the mountains or the bridges. I never do seem to get out into it with my camera however. One of these days I’m going to get up to the Marin Headlands when the fog rolls in. Just imagine what the world of horror movies would be like without fog! It sets a mood, for sure. If you have been waiting for the paperback to get your copy of Where Shadows Fall, your wait is over. As of this morning, the paperback is available. Click HERE to get it. We’re headed into the busiest time of year, with holiday parties and get togethers, shopping and cooking and chaos of all kinds. My life is no exception. I’ll be trying a new-to-me cookie recipe this coming weekend for a company pot luck, and I have my first holiday party tomorrow evening. Then it’s all a landslide into Christmas for me. What about you, Readers? Do you have a special holiday tradition, no matter what holiday you celebrate? 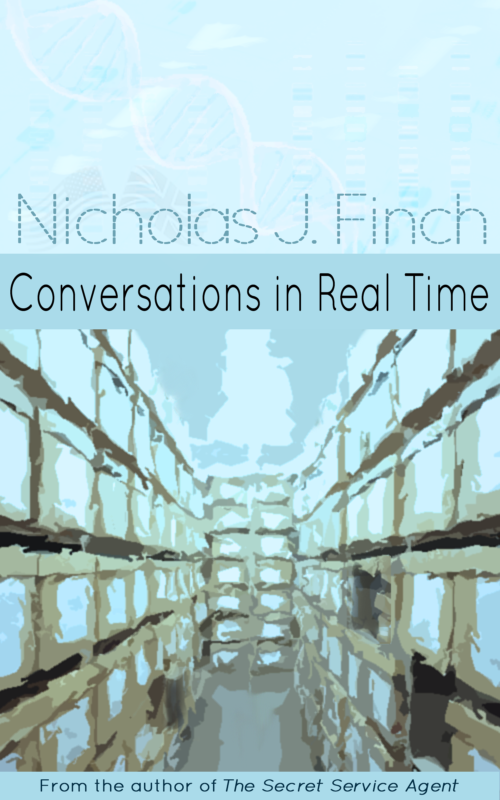 Conversations in Real Time now Available at Amazon! If you’ve already bought the book and loved it – please leave a review on Amazon! If you haven’t read it – now is a good time! Or you can give it as a gift. To keep updated on my Published work subscribe to my Website. Summary:After being kidnapped from her family, Ababuo never expected to be a parent again, but while traveling through North Africa carrying messages to her old Clan, something happened to change that expectation.